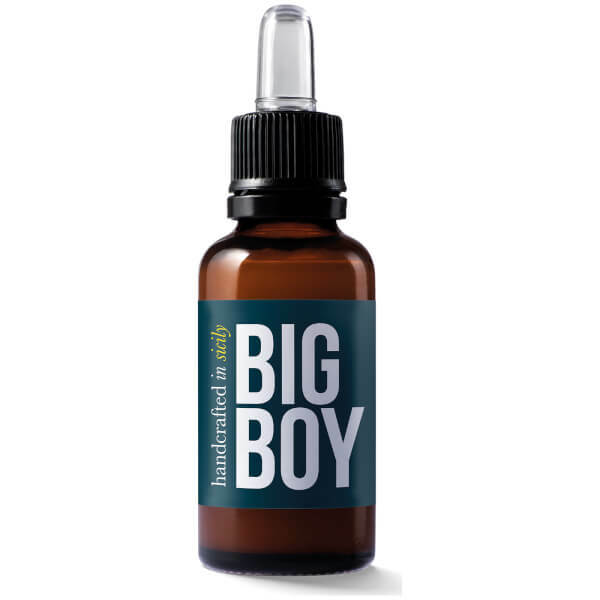 Treat your skin to the nourishing and calming properties of Big Boy Soothing Drops, a luxurious fluid emulsion that works to moisturise and relieve the skin beneath your beard. Produced in small batches in an artisan Sicilian laboratory, the solution combines Argan and Sweet Almond Oils with Calendula extract (considered a natural anti-irritant) to expertly soothe and calm skin after cleansing or shaving. Not just for skin beneath the beard, it can also be used as a post-shave treatment to leave the freshly shaven area feeling comfortable and conditioned. Equipped with a pipette delivery system for mess-free application. A fluid emulsion to be applied on the beard and skin after cleansing. Designed for skin under the beard but can also be used as an excellent aftershave. Aqua, Prunus Amygdalus Dulcis Oil, Glycerin, Argania Spinosa Oil, Helianthus Annuus Seed Oil, Tocopheryl Acetate, Phenoxyethanol, Sodium Benzoate, Potassium Sorbate, Calendula Officinalis Extract, Acrylates/C10-30 Alkyl Acrylate Crosspolymer, Carbomer, Citronellol, Sodium Hyaluronate, Amyl Salicylate, Linalool, Alpha-Terpineol, Geraniol, Coumarin, Linalyl Acetate, Piperonal, Sodium Hydroxide, Isoeugenol, Dipropylene Glycol.